Philly is such a great city. It's literally packed with a ton of absolutely incredible restaurants, coffee houses, bakeries, and cafes. Not to mention the shopping, all the history of the city, and some really fun tourist attractions and parks. Even after living there, and spending a large amount of days off in the city, we still are always finding new things to do, restaurants to try, or going back and revisiting some of our favorites. I know that sometimes the hardest part of planning little day trips are figuring out what to do, so I decided I would start blogging about some of our little adventures (or sometimes just mine:) when we visit. Hopefully these posts will give you some inspiration if you live in the area and are looking to change things up, or if you're just visiting and maybe looking for other things than just want you'll find on the basic tourist websites. I also love the idea of just doing it for myself to be able to look back at all the fun things we've done! On Valentines Day Frank flew back in from a job he was away for, so he suggested having lunch in the city and making our own little dinner that night. I loved that idea! Personally, I'm not huge on going out for dinner on Valentines Day. Restaurants are always packed and most do specific (more limited) menus. I just don't feel like I get the true experience of the restaurant on days like that. But lunch is a much more relaxed affair. Pub and Kitchen sits only a couple blocks away from Rittenhouse, but in a spot with a much more neighborhood feel to it. 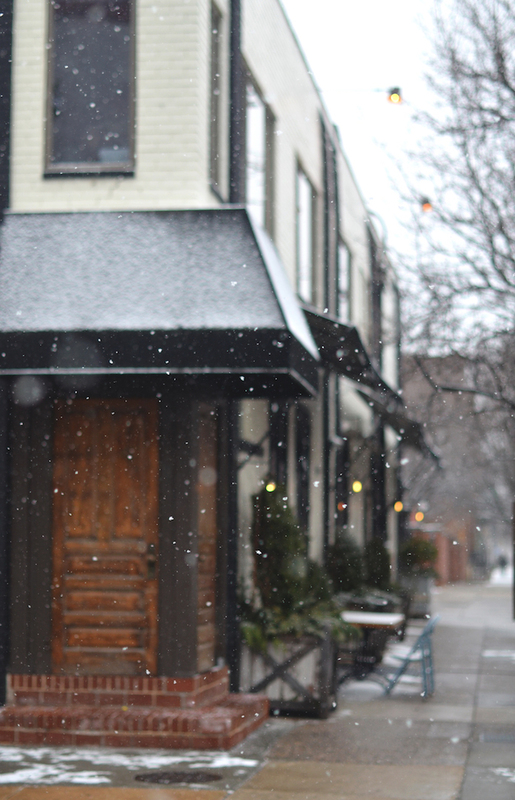 It was lightly snowing as we walked up to the painted brick exterior and turned the charming little antique door knobs. The bar is clearly a main attraction of the space, and it greets you immediately. We sat at a quaint little table between several other couples right off the bar. I love that their brunch menu (which is only served on the weekends) includes a good mix of breakfast and lunch and isn't just heavy on one or the other. Of course, I couldn't resist getting actually breakfast, and Frank tried one of their burgers. For how busy this little place was, our food actually came out fairly quickly. Frank let me steal some of his fries, which made me kind of wish I just had a whole plate of them. I love those shoe-string extra crispy fries like they have! Yum yum yum. I was glad we had come at the end of the brunch rush though, since it was quite loud when we first got there, but quieted down as we ate. It's definitely a place I would go back from brunch to again though, my eggs and bacon were especially delicious, and I would love to try a burger too. It's also in a pretty great spot too, since it's not right in the middle of the Rittenhouse craziness finding a parking spot wasn't too bad (which is always something to consider in Philly!). Termini Brothers Bakery is one of those places that just oozes with vintage charm. From the old school neon sign that greets you a block away, to the antique counters piled with traditional Italian sweets. Since we decided to make our own Valentines dinner we thought we would treat ourselves and bring home dessert! This was our first time at Termini's and decided to go right to their flagship store in south Philly. Of course, the whole feel of the store stole my heart, with its original tiled floors and tin ceiling. We did a lap around the bakery to survey the goodies, and I had a hard time deciding between their amazing looking Tiramisu or a cupcake. But it was Valentines Day after all, so how could I pass up something covered in pink and red and topped with a heart? Frank got a slice of their classic cheesecake, and while one of the sweet girls was ringing us up an older man insisted we take one of their unique chocolate covered bananas, on the house. Needless to say, everything was delicious and had that perfectly unique Italian bakery taste. I was actually a little scared to try the banana, but it ended up being amazing! Color me smitten. Since it was snowing, we headed home to enjoy a quiet Valentine together, but I've already been thinking up a long list of things I can't wait to do this summer and new places I want to try! Oh summer, come a little faster, won't you?